We often take the SINE, COSINE, or TANGENT of an ANGLE. Thus, for these 3 main trigonometric functions, we INPUT an ANGLE, and get an OUTPUT that is a RATIO (the sine, cosine, or tangent ratio). Yet the INVERSE TRIGONOMETRIC FUNCTIONS literally UNDO what the trigonometric functions do. Thus, here, we INPUT a RATIO and get an OUTPUT that is an ANGLE. Interact with this GeoGebra resource below to see this in action. 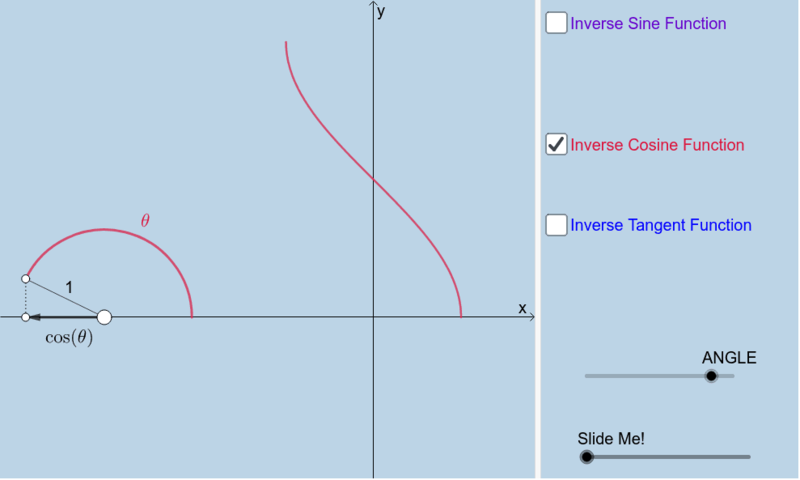 Here, you can select to display the graph of the inverse sine function, inverse cosine function, or inverse tangent function. Note: The inverse trigonometric functions are also called the ARCsine, ARCcosine, and ARCtangent functions. Note ARC is synonymous for ANGLE. These functions always output an ANGLE.